This PDF 1.3 document has been generated by QuarkXPressTM: LaserWriter 8 8.7.1 / Acrobat Distiller 8.1.0 (Macintosh), and has been sent on pdf-archive.com on 06/04/2011 at 03:53, from IP address 75.79.x.x. The current document download page has been viewed 917 times. File size: 990 KB (24 pages). Are crackdowns on basic freedoms increasing? forces on pro-independence demonstrators in Tibet. no business interfering in China’s internal affairs. growth lead to Westernstyle democracy? A new Amnesty International report lists numerous rights violations. civil fines of up to $100,000. report in print or electronic format (PDF), visit www. at Washington, D.C., and additional mailing offices. POSTMASTER: Send address changes to CQ Researcher, 2300 N St., N.W., Suite 800, Washington, DC 20037.
persists, according to the U.S.
perity — the ubiquitous con• Repressing religious freedissent and tramples basic freedoms. “human-rights disaster” in China dur- sparked internal unrest. In July, an exSudan’s Darfur region. Tanzanians and lowest in Europe, Japan and the Americas. countries surveyed are shown above. country over health and safety issues. a difficult balancing act given the country’s unprecedented speed of change. of how far the West should go in pressing China to improve its human rights. group in San Francisco and Hong Kong. (free elections, media independence and freedom of expression). toward a presumption of guilt, especially in high-profile or politically sensitive cases. and driven by political pragmatism. rights remain “very limited,” he says. clining. Even the government under“China is a developing country with dissent — then they’ve made remarkstands there are certain things you a population of 1.3 billion, and China’s ably little progress over the last 30 years. ful significant progress will occur in with the economic progress,” he says. before his arrest, he had deplored the “human-rights disaster” in China. instituting legal and economic reforms. despite some gains in recent years, months leading up to the Olympics. in recent history,” Cheng says. cil, said human rights do not advance sion. But, “if you define human rights of Human Rights Watch’s Asia Division. class is the key to China’s future. of legitimacy goes out the window. What’s going to happen to the country? some kind of democracy that includes a multiparty political system. its support for repressive regimes elsewhere, he argues. range of offenses are profiled below. advocating independence for Xinjiang Province. The group is designated by China as a terrorist organization. outside the country.” On top of his prison sentence, he received three years’ deprivation of political rights. by the China office of Yahoo!, which agreed to pay his legal expenses. for heart disease in Chuandong Prison in Sichuan Province. of nine senators, nine House members and five senior administration officials. help end human-rights abuses in warravaged Darfur. clean of any taint of abuse. approach says the Brookings Institution’s Cheng. on political and human-rights issues. China so far under the WTO rules? Western music and other cultural expressions were suppressed. not seen for more than two decades. countries and helped lay the groundwork for China’s opening to the West. quickly retracted that figure under intense pressure from the government. promises to improve its human rights. Mao is born in Hunan province. Mao leads Communists to power. China sets up China Academic Network, its first computer network. China’s bid to host 2000 Olympics. Mao dies; power fight ensues. and progress on human rights. Hu in Australia and emphasizes U.S.
concern about human rights. . . .
Olympic Torch Relay hit by antiChina protesters around the world. country for start of Olympic Games. Olympics to be held in Beijing. But private media continue to push boundaries. Chinese reporters and foreign correspondents working in China. more latitude in covering the country before and during the Games. The rules, which took effect in January 2007, expire in October. to stem abuses in places like Darfur. gains of some citizens in recent years. trying to report on provincial unrest. a window on China. The rules coincided with this year’s massive earthquake in Sichuan Province, which was heavily covered by both Western and Chinese media. social unrest they have generated. Central Propaganda Department” and provincial authorities blocking coverage of sensitive local issues. ‘Sensitive’ Stories,” Human Rights Watch, July 2008, http://hrw.org/reports/2008/china0708/. 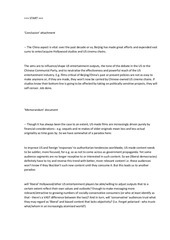 June 2008, p. 8, http://cpj.org/Briefings/2007/Falling_Short/China/china_updated.pdf. to Protect Journalists, July 8, 2008. 6 For background, see Brian Beary, “Separatist Movements,” CQ Global Researcher, April 2008, pp. 85-114. Schools,” The Wall Street Journal, June 18, 2008, p. 10A. 8 “Falling Short,” op. cit., p. 8. Times, July 15, 2008. See Philip P. Pan, Out of Mao’s Shadow (2008). perhaps 15,000 in the late 1990s. Protests reflect rise of citizen activism, hope for future. “The air stinks from the factories,” said villager Wang Yuehe. protests — many peaceful but some violent — that have occurred in China in recent years as the nation’s exploding economic growth has led to some of the world’s worst environmental damage in history. make way for new buildings and infrastructure. drop in a much bigger ocean of ecological blight in China. rise in rural areas since 2005. 750,000, but Beijing reportedly did not want to release the figure, fearing it would incite social unrest. by their administrative region,” it said. got to give,” she wrote. from the city before Olympic Games begin in August. itself — see reason for hope. In a response to Economy’s ar- The New York Times, April 13, 2005. July 1, 2008, p. A6. Yingling Liu, China program manager at the Worldwatch In- 3 Elizabeth C. Economy, “The Great Leap Backward?” Foreign Affairs, Sepstitute, an environmental advocacy group, said Economy “un- tember/October 2007.
these problems, both in the Chinese government and in the 5June 2008. United States and other industrial countries are complicit in Institute, Nov. 29, 2007, www.worldwatch.org/node/5510. child back later, she says. China,” he said in Beijing this summer. to 100. For second births, the national ratio was 152 to 100.
are guardedly optimistic. George J.
started the revolution? For human rights. them — we have to behave like them. United States do, he added, “but . . .
whose views differ from the official ‘harmonious’ government line,” said Rep.
continues to thwart foreign journalists. economic means to achieve political ends usually fails. they send a clear, disapproving message to the targeted country. support sanctions, the pressure on China would be substantial. leadership to grant some concessions. goes to jail and what can be said, read and heard. 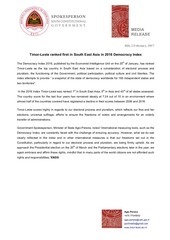 troublemakers and religious and ethnic groups has intensified. should not be out of the question. and embolden hard-liners in Beijing. and civil society is advancing, as was evident in the spontaneous response to the Sichuan earthquake. and good for the world. and Cuba. Instead, sanctions would be an act of economic suicide, endanger U.S.-China relations and threaten world peace. its policy of engagement and avoid destructive protectionism. It would be more constructive to welcome China as a normal rising power, admit it to the G-8 and continue the Strategic Economic Dialogue initiated by Presidents Bush and Hu. move China toward a legitimate rule of law. ment now sees it as something to get stall disruption and protests. For exreport on issues government officials through,” rather than an opportunity ample, she said, the government emptied the “Petitioner’s Village” in Beiare determined to conceal,” Human for greater opening. ings of China’s large detention system, Olympic-torch relay are among the events against local officials. many as 10,000 petitioners in BeiMann says. out in September bespokesman in Washfore the Party Congress. last year but said the true figure may be far higher. greater freedom and human rights. frame of reference was a period of about vironmental and corruption problems internal policies. not mean that they are not occurring. Internet remains a powerful and pervasive force for change. role in the Darfur crisis. “Educated young Chinese are . . .
past thousands years,” Forney wrote. human-rights reform is likely to persist long into the future. country from spinning out of control. build support for the governing regime. been forced out of their homes. class and increasing social unrest. Rights Challenges (2008), pp. 36-37. Political Landscape (2008), p. 2. July 19, 2008, p. A1. for newspapers and other publications. He has written previously for CQ Researcher on “Domestic Poverty,” “Curbing CEO Pay” and “Mass Transit.” He holds a BA in English and an MA in journalism from Indiana University. Wall Street Journal, June 18, 2008, p. 10A. York Times, March 18, 2008. 17 Xinhua News Agency, op. cit., April 21, 2008. The New York Times, April 25, 2008. Sponsors,” Condé Nast Portfolio, July 2008, p. 21. The New York Times, June 4, 2008, p. A23. Broadcasting Service, Feb. 13, 2003. 34 Quoted in Worden, op. cit., p. 26. 40 U.S. Department of State, op. cit. March 11. 1, 2008, accessed at http://chrissmith.house.gov/UploadedFiles/080701BeijingPresser20001.pdf. www.chinaaid.org. Monitors religious persecution in China. 10001; (212) 465-1004; www.cpj.org. Promotes press freedom around the world. 986-0536; www.duihua.org. Promotes human rights through dialogue with China. Embassy of the People’s Republic of China in the United States, 2300 Conn.
Ave., N.W., Washington, DC 20008; (202) 328-2500; www.china-embassy.org/eng. Provides news and other information on China. to promote human rights in China and worldwide. works to protect safety of journalists. litical and Social reform in China: Alive and Walking,” The Washington Quarterly, summer 2008.
press release, July 7, 2008, www.hrw.org/english/docs/2008/07/03/china19250.htm. websites,” The Christian Science Monitor, Sept.
and Beijing,” in Worden, op. cit., pp. 96-97. 57 Fowler and Ye, op. cit. The New York Times, April 13, 2008, www.nytimes.com/2008/04/13/opinion/13forney.html? Prospects for Democracy, Brookings Institution Press, 2008.
for Democracy in China,” Foreign Affairs, January/February 2008, www.foreignaffairs.org/20080101faessay87101/john-l-thornton/long-time-coming.html. Mann, James, The China Fantasy: How Our Leaders Explain Away Chinese Repression, Viking, 2007. Condé Nast Portfolio, July 2008.
the Beijing Olympics should do more to press for humanrights reforms. the human-rights responsibilities and contributions of multinational corporations operating in China. The media director of Human Rights Watch presents a collection of articles by experts on human rights in China. Social Reform in China: Alive and Walking,” The Washington Quarterly, summer 2008, www.twq.com/08summer/docs/08summer_gilboy-read.pdf. Pei, Minxin, “How China Is Ruled,” The American Interest, Vol. III, No. 4, March/April 2008, www.the-americaninterest.com/ai2/article.cfm?Id=403&amp;MId=18. “China (includes Tibet, Hong Kong, and Macau): Country Reports on Human Rights Practices — 2007,” U.S. This annual assessment concludes that human rights “remained poor” last year in China. 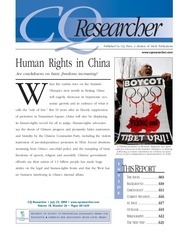 Aid Association, June 2008, http://chinaaid.org/pdf/PreOlympic_China_Persecution_Report_in_English_June2008. accompanied by a “significant deterioration” in religious freedom for China’s Protestant Church, the report says. that emissions of three important pollutants declined in 2007. Foreign Affairs, September/October 2007, p. 38.
what is considered safe by the World Health Organization. from raising human-rights and other political issues in Beijing. Nightmare,” Foreign Affairs, July/August 2008, pp. 47-56.
has exacerbated its human-rights record. Report, Feb. 25, 2008, p. 28.
economic strength to the world, not to improve its humanrights situation. Washington Post, Feb. 10, 2008, p. A17. government of reneging on promises of press freedom. Spying,” The New York Times, Feb. 6, 2008, p. A10. “A Lama in Sheep’s Clothing?” The Economist, May 10, 2008.
fear and distrust, according to the Dalai Lama. Besieged China,” Los Angeles Times, March 13, 2008, p. A3. Tibet,” The San Francisco Chronicle, May 1, 2008, p. B3. Newsweek International, May 5, 2008.
themselves will be the biggest victims. vary, so please check with your instructor or professor. Jost, K. (2001, November 16). Rethinking the death penalty. Need backup for a debate? Want to become an expert on an issue? visit your library or www.cqresearcher.com. format (PDF), visit www.cqpress.com or call 866-427-7737.
electronic-rights licensing are also available. volume—start at $803. Add $25 for domestic postage. and browse more than 3,600 in-depth reports. For a free trial, visit http://library.cqpress.com/trials. expert, nonpartisan reporting on the vital issues that have shaped our society. This file has been shared by a user of PDF Archive. Document ID: 00029745.